Japanese Episode AG 085: "Hiwamaki Jimu! Oozora no Tatakai!!" American Episode 357: "Sky High Gym Battle!" The battle for Satoshi's sixth Houen League Gym Badge has begun! The first match pits Nagi's Tyltalis against Satoshi's Juptoru. Satoshi's friends seem worried that Juptoru's type disadvantage will cost it the battle, but the grass-type pokemon is able to dodge all of Tyltalis' attacks by using its incredible speed. Satoshi's pokemon surprises Nagi when it appears behind her pokemon and delivers a Leaf Blade attack that sends Tyltalis slamming into the ground, knocking it out! After his victory, Satoshi recalls his Juptoru and brings out his Pikachu to face his next opponent, Pelipper. Satoshi seems confident that his electric-type will be able to earn a quick victory, so he commands Pikachu to use Thunderbolt. 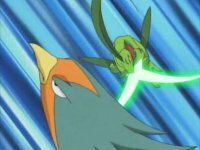 However, the attack has no effect because Pelipper is using its Steel Wing technique to act as a lightning rod! As Pelipper uses a Hydro Pump attack on Pikachu, Satoshi notices Pelipper's wing leaving the ground, so he takes the opportunity to attack. Pikachu defeats Nagi's Pelipper with a powerful Thunderbolt, but it gets knocked out itself by Pelipper's Hydro Pump. Nagi congratulates her opponent for his progress so far, but she is confident that she can win with her final pokemon, Ohsubame! Satoshi chooses his Juptoru to fight against Nagi's pokemon, but he is surprised when it is defeated by an Aerial Ace attack. As Takeshi explains the ways in which the Aerial Ace attack is dangerous, Satoshi calls on his own Ohsubame to finish the fight for him. Satoshi's pokemon doesn't seem able to score a hit for the entire battle, and it seems like Nagi's Ohsubame will win the match. However, Satoshi develops a plan that has his pokemon kick up some dirt in order to see through Ohsubame's Aerial Ace, enabling it to break through Ohsubame's defenses and deliver a victory-earning blow! With all of Nagi's pokemon knocked out, Satoshi has earned himself a Feather Badge! Nagi congratulates her opponent for a battle well fought as the young trainer from Masara Town prepares himself for his next Gym Battle. Eh, part of me likes this battle, and part of me doesn't. I thought parts of it were rather clever, but at the same time I kept getting distracted by the really cheap parts. I'm sick of Satoshi's impossible victory being explained by "Satoshi's Ohsubame has a high endurance, so it can take more attacks than its opponents," as if that gives the show's writers a carte blanc to give us cheap battle after cheap battle. I know that a lot of people praise the animation in this episode, but I really don't see what everyone's talking about. The actual animation isn't any better - the show's animation is still incredibly low-budget, with little more than moving mouths and static characters set against moving backgrounds - but for some reason everyone picks this episode out as standing out for some reason. The only outstanding things to me, art-wise, is how off-model Musashi looks throughout this episode (she's waaaay too skinny in most of her scenes) and the gimmicky use of weird camera angles throughout the episode. I mean yes, a worm's eye view or two looks nice, but this episode overuses these camera angles to the point of redundancy. The dubbed version surprised me because they kept in the part about Nagi praying to the god of the sky, which most fans had assumed to be rewritten to appease the censors. I guess it just goes to show you that predicting what will be censored and what won't be censored is almost impossible to do. The only edits this episode had were time cuts, and even then there aren't even that many to report. A second is cut from the shot of the smoke clearing right after the Trainer's Choice commercial break.